How Messy Is a Fiberglass Pool Installation? 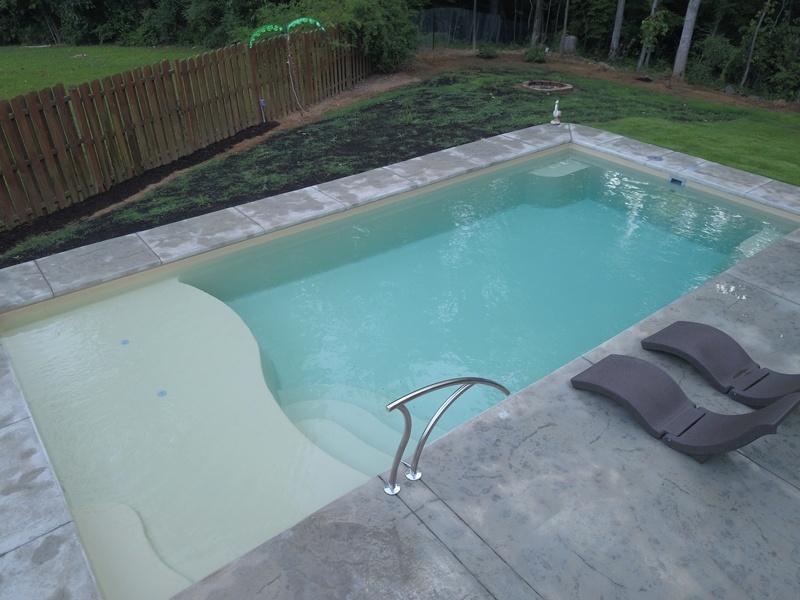 A fiberglass pool installation is, relatively speaking, less messy than vinyl liner or concrete. However, note that I said less messy, rather than not messy. We're using giant machinery to rip out a ton of earth and put in your glittery new pool. It's not a clean, tidy process. There tends to be a rose-colored-glasses assumption that there won't be that many machines, and they won't make that much of a mess. In the past we've heard people say, "I didn't know my yard was gonna be such a mess. No one told me." Well, it's time someone told you—and that someone is River Pools. There's a reason we recommend that for new-built houses, you should put in the pool before the landscaping and driveway. Get the messy work done first. Afterwards, you can craft the beautiful details and know that they'll stay in good shape. How messy will your yard get during a fiberglass pool installation? What will mess up the yard during a pool installation? These machines will more than likely leave large, muddy ruts in your yard, sometimes 2 ruts if it's a tandem axle—that is, when there are two wheels side-by-side in the back. Yes, I had to check the definition of "tandem axle"; don't judge me. Good news, though: you can fill in these ruts after the fact. You might even be able to use the piles of dirt to do it. Reduce, reuse, recycle. You'll want to say your goodbyes to your grass before the installers arrive. Between the machinery and the piles of dirt, your grass is going to The Big Lawn In The Sky. You'll have to replenish that grass in areas outside the pool and patio. Unfortunately the damage isn't limited to the earth. The machinery might also damage your driveway. It could crack in the sides, especially if it's asphalt or concrete. Now, let's talk specifically about the excavator and the skid loader for a second. The excavator has to get from one end of the pool dig to the other, and it needs to maneuver everywhere that the patio will be. Translation: it'll leave trails everywhere. 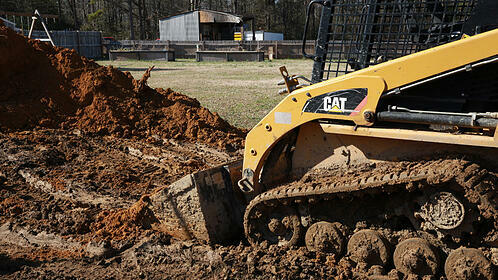 Okay, so, the first question is what a skid loader even does. At least, that was my first question. The answer: It moves big loads around, like dirt and stone. It's the workhorse of the project site. While it does the heavy lifting, the skid loader basically leaves you a road, but not in the nice way. This is a muddy, dirty mess stretching from lots of different points in and around the property. 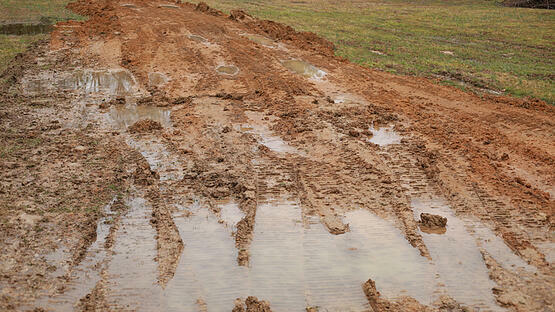 It'll create these muddy paths and roadways throughout the project, in various places around your property. What happens with all the dirt that comes out of the ground during a pool installation? So the pool installer excavates the hole where the pool will go. Cool. The excavated dirt has to be stockpiled nearby. Listen. This ain't your average pile of dirt. This is a PILE of DIRT. Maybe you need some dirt on your property at some point down the road. If you keep this pile, it'll be ready for you when the time comes. Note: Some localities require dirt to be hauled away. Be aware of any rules about this in your area. Either way, all that dirt has to be stockpiled somewhere near the pool hole. If it's going to stay on the property, it'll be moved again to another location. 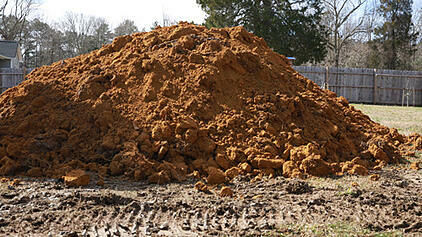 Remember, wherever it sits, this pile of dirt will cover an area of grass at least the size of your pool or larger. Consider this space dead to you. You'll have to replenish it with new grass once the dirt is moved to its forever home. How long will the yard be messy from a fiberglass pool installation? Just remember, none of this damage is permanent. On top of that, the exact duration of the chaos depends on the pool project. Fiberglass pools have the shortest installation time of all 3 types, so the mess lasts the shortest time. You can expect your fiberglass pool, patio, and landscaping to be fully installed within 3–6 weeks, on average. And to help take your mind off the mess, you can actually swim in your pool by day 2. So how does that compare to the other pool types? Vinyl liner pools take a little longer than fiberglass. The average installation lasts for 4–8 weeks. Concrete pool construction lasts for months. Yes, 3–6 months. Some friends of mine are getting a concrete pool, and their backyard has been messed up since Hanukkah. It's springtime now, and the yard still looks terrible. Poor things. Is a fiberglass pool installation really worth the mess? Well...take a look and decide for yourself. Whether you love all-out aesthetics or prefer to keep life simple, the end goal of your pool project will be a thing of beauty. Here at River Pools, we're firm believers in fiberglass pools. That's not because we deny the benefits of vinyl liner or concrete, but because we've seen how much joy fiberglass pools bring families across the country. 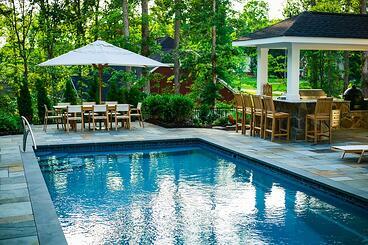 We manufacture and install fiberglass pools in Virginia and southern Maryland. 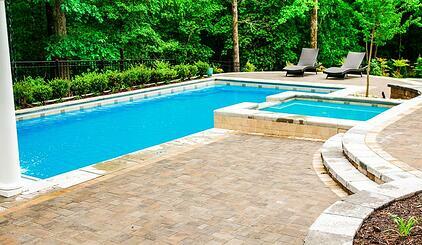 Our pools are also available in other areas of the United States through our dealers. Interested in seeing more styles? You can look at all the fiberglass pool designs we offer, as well as the available tanning ledge and spa add-ons. You can also check out our free ebook if you'd like to learn more about creating your own fiberglass pool oasis. 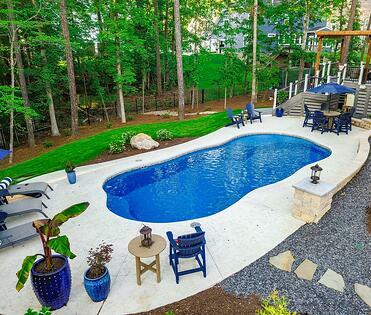 We answer every question about the process of designing and buying that dream backyard.